How long have you had your throw pillows? Well, anything that gets used a lot should be replaced about every 18 months. That’s because the fabric and foam core gradually pick up dead skin, dust mites, sweat, and even fungus – which can trigger breathing problems, from allergies to asthma. So, if your throw pillows seem a bit flat, or they don’t spring back when you fold them in half – toss them and go shopping. STOP! Wash that blanket before you use it. Before you add a wool blanket to your bed – or cozy up with one on the couch, know this: It could be teeming with dust mites. According to microbiologist Dr. David Clarke, when both wool and cotton were exposed to microscopic mites, the wool attracted 42% MORE mites than the cotton. That’s because wool has a deeper pile, with more twists in the fibers… which allows mites to crawl inside, hunker down and multiply. So before you get out the wool blanket, wash it and allow it to dry completely. Then repeat the washing and drying every 2 weeks. First, let’s deal with your Christmas tree. Research shows that ONE IN TEN people have an allergic reaction to a substance found in Evergreen sap. And millions more get stuffy from the natural pollens on Christmas tree branches! So before you drag that new tree into your house, spritz it down with your garden hose. Then make sure the room you put it in is well ventilated. Research shows that opening windows and circulating fresh air for at least 10 minutes a day, will cut your allergy flare-ups in HALF. Next, let’s deal with your eye-watering Christmas decorations. Chances are if you’ve had them in storage for a year, they’re covered with a thin layer of dust, pet dander, and mold spores. So wrap the ornaments in a plastic bag and stick them in the freezer for about five hours. That’ll kill off 100% of the dust mites. Scented candles, incense and dirty chimneys are the worst indoor pollutants. That can be as dangerous as second-hand smoke! So use electric candles that you plug in instead of light up. And get your chimney and fireplace cleaned by a professional. Let’s start with: Your bed. Dr. Tierno recommends changing your pillowcases and sheets every week, to guard against the build up of dust mites, and lower your risk for bed bugs. But this survey found that at least one-in-four people wait a month or more to change their bedding. Next: Your shower. 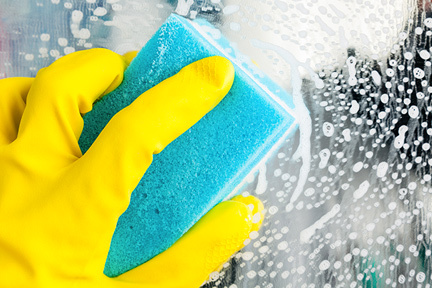 Dr. Tierno says bathtubs and shower stalls need to be scrubbed and disinfected weekly, to remove the build-up of “biofilm.” That’s the thin layer of dirt, sweat and grime that you leave behind every time you step out of the shower. But this survey shows that about half of all people wait anywhere from a month to six months to scrub the tub. Finally, how hygienic is your fridge? Dr. Tierno says refrigerators should be cleaned at least once per month to limit your exposure to sickness causing E-coli and salmonella. But a whopping 40% of people surveyed say they wait anywhere from three months to a year before cleaning their fridge.